A complete checkout of the spacecraft and its redundant subsystems. Three small trajectory correction maneuvers that precisely steered our little craft toward its Pluto aim point, some 2 million kilometers off Jupiter's limb. A complete checkout and initial calibrations of all seven on-board scientific instruments. The design, testing and installation of new guidance and navigation, fault protection/autonomy, and command and data handling software packages that repair bugs found in flight and enable a variety of new capabilities. Tests of target-tracking capabilities during a serendipitous, target of opportunity flyby of the small asteroid 2002 JF56, now officially named "APL" by the International Astronomical Union. Initial planning for the first hibernation phase on the cruise from Jupiter to Pluto. 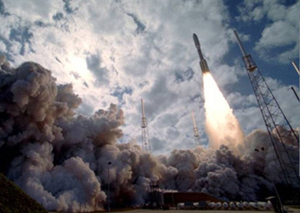 Preparation of more than 700 separate Jupiter science observations scheduled for January-June 2007. The start of Jupiter approach observations on January 6, 2007. In learning to fly our "bird," we've also come to work the kinks out of our ground systems, our ground-based spacecraft simulator, our flight-control processes and our data-reduction and observation planning tools. These many activities summarize the busy year we've had, but they hardly capture the intense workload for the small science and operations teams that together operate New Horizons. Now, as we think about the one year behind us and the almost 8 1/2 years to go to reach our first frontier destination — the Pluto system — we're humbled by the task ahead: We must be good stewards of New Horizons as it flies another 2.5 billion miles, or more than 4 billion kilometers! The iconic cartoon image of Lucy pulling the football away from Charlie Brown (in Charles Shultz's "Peanuts" comic strip) is a constant reminder to us all on New Horizons that, despite what the spacecraft and team have accomplished, we are not yet even close to achieving our goal. The lesson here is clear: We have a lot to be proud of but we can never let our guard down, for the goods we aim to bring home are still far beyond our present position, and almost a decade still hence. But enough on that. We have a Jupiter encounter under way and it's already exciting. Before I turn to the beginnings of our Jupiter encounter, I want to cover a topic I promised I would in my last PI Perspective on January 5. It's called "New Horizons Kids." The idea came to me when I saw a marvelous image (from Florida Today) of two boys watching our launch last year. That image gave me the idea that we could follow the development of some children growing up during our 9 1/2-year journey from Earth to Pluto. So, today, I am announcing a new part of our Education and Public Outreach program called New Horizons Kids, or NHKs. We're looking for four to six boys and girls born on January 19, 2006, and another four to six kids who turned 10 that day. We'll follow those 10 or 12 kids as they grow to be 10 and 20 years old, respectively, while our dream machine New Horizons soars across the solar system. From time to time, we'll check in on our kids, and by the time the newborns from launch reach 4th grade and the 10-year-olds from launch reach the middle of college, we'll be at Pluto. So, if you or a relative or a friend has a child who was born on either January 19, 2006, or January 19, 1996, please send the child's name, birth date, a recent picture and the names and e-mail address(es) of their parents to web-NewHorizonsPlutoPals-contact@jhuapl.edu. We'll collect nominations until we pass Jupiter, and then we'll announce the roster of children we'll be following for another 8-plus years as New Horizons Kids. Now let me turn to my final topic for this time: We are now in full swing doing Jupiter approach observations. Already, our SWAP and PEPSSI instruments are measuring the particle environment upstream of Jupiter, looking for the first signs of the giant planet's magnetospheric influence, which we hope to detect early next month. At the same time, our LORRI and Ralph imagers are already training themselves on Jupiter, assessing its meteorological state and using its satellites for both optical navigation practice and calibration targets. So too, our REX radio science package has begun testing using the Jupiter system as a calibration source, and our Alice ultraviolet spectrometer will begin an intensive set of observations of Jovian aurora and the Io plasma torus in just over a month. 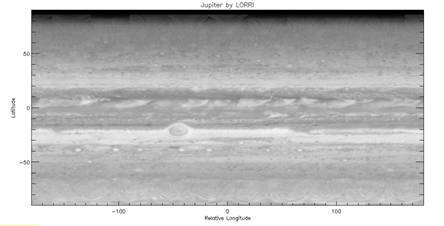 The first preliminary cylindrical projection map of Jupiter's meteorology made by New Horizons, obtained by our LORRI high-resolution telescope-imager in early January 2007. Exciting results are already revealing themselves. Early LORRI imagery of Jupiter has revealed the planet's atmospheric state to be unlike what Cassini or Galileo saw, and much more reminiscent of the 1979 Voyager 1 flyby. In fact, just last week, Jupiter expert Dr. Kevin Baines of the Jet Propulsion Laboratory, one of our mission science team collaborators, wrote on seeing the first LORRI approach images: "It seems clear that Jupiter is showing us a different face than we've seen on previous encounters. Jupiter's equatorial and southern tropical latitudes seem remarkably quiescent, all the way down to the Great Red Spot (GRS). It seems the skies are clear over a much larger fraction of the planet than has been typically encountered by these other spacecraft . . .so it seems we may not get the typical ammonia-cloud storms forming in the GRS turbulent region. However, Jupiter is known for dramatic spurts of activity, and we can keep our fingers crossed that something a bit more exciting might happen before late February . . . But if Jupiter remains relatively quiet, this might give us a valuable opportunity to effectively plumb the obscure depths of Jupiter below the ammonia clouds. In particular, these clear skies mean we can look deep over nearly the entire turbulent region northwest of the GRS. With the spectral mapping capability of LEISA, this could give us the first near-IR spectral identification of deep water clouds there, if the skies are clear of the ammonia hydrosulfide cloud as well." Another of our key Jupiter experts, mission science team collaborator Dr. Amy Simon of NASA's Goddard Space Flight Center, was also impressed with our first images of the giant planet, and wrote: "I'm struck by how similar the equatorial region appears, compared with a Voyager 1 map. Away from there, the GRS is still rounder today, and currently shows less convective activity in the region to its west. We also don't see brown barges in the north, but we haven't seen those since Voyager, anyway. The 'Little Red Spot' is still red, but that region may be showing some other activity." This is so cool! We set out for Pluto-Charon and the Kuiper Belt thinking of Jupiter as little more than a gravity assist target and a testing ground in preparation for the real meat and potatoes that lies ahead in the second half of the 2010s. Yet, even our first Jupiter system observations are revealing new things about the solar system's largest planet. And those first images were taken more than 35 times farther than we will be at closest approach. So hold on to your hats, sports fans, it's going to get better and better over the next six weeks. Jupiter, here we come! Well, that's all I have time to write just now. I'll be back with another update soon, as Jupiter nears. In the meantime, keep on exploring - just like we do.